Da yuan shuai (ta yuan shuai; Chinese: 大元帥; pinyin: dà yuán shuài; Wade–Giles: ta4 yüan2 shuai4) was a Chinese military rank, usually translated as grand marshal or generalissimo. During the early Republic of China, the rank of "grand marshal of the army and navy" (陸海軍大元帥) was assumed by Yuan Shikai in 1913, Sun Yat-sen in 1917 and Zhang Zuolin in 1927. 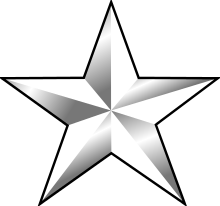 The rank was replaced by the Nationalist Government with the "general special class" or "generalissimo" (特級上將) and awarded to Chiang Kai-shek in 1935. The rank of "grand marshal of the People's Republic of China" (中華人民共和國大元帥) was proposed after the establishment of the People's Republic (perhaps for Mao Zedong), but was never conferred. ↑ Linda Pomerantz-Zhang (1992). Wu Tingfang (1842-1922): reform and modernization in modern Chinese history. Hong Kong University Press. p. 255. ISBN 962-209-287-X. Retrieved 2010-10-31.